SWORDSMAN AND ENCHANTRESS Swordsman and Enchantress is a 1978 Shaw Brothers release directed by Yuen Chor. It stars Ti Lung (Xiao), Ching Li (Mrs. Lian), Candy Wen (Little Lord) and Lily Li (Lady Feng). Based on Gu Long's The Eleventh Son, Swordsman and Enchantress is about a martial world thrown into disarray over a sword called Deer Carver. As the sword is being escorted to the villa of Master Lian, it is stolen by a martial expert named Little Lord. 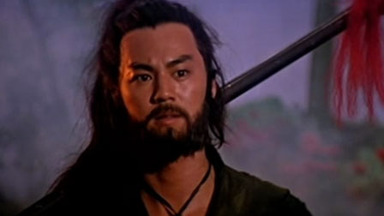 The hero, Xiao, finds himself at the center of the villain's evil schemes when he is framed for the theft. After Little Lord kidnaps Mrs. Lian (the master's wife) and and tries to once again put the blame him, Xiao rescues her. He then fights to protect her against Little Lord, the chief villain's crazed lackey. In the process he falls in love with Lian's wife and eventually is imprisoned in the strange and seemingly magical, Solitary Villa, where he must face Little Lord's master and deal with surprising treacheries. The above is a very concise, perhaps slightly misleading, overview of the plot. 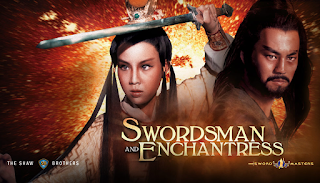 Swordsman and Enchantress is the kind of movie that winds and weaves in a number of directions and it's crammed with big personalities. It is only loosely based on The Eleventh Son, by Gu Long, and those who have read the source material will follow the film more easily. Still I think it is the kind of movie where understanding every last detail isn't so important on the first viewing. By the second watch you'll definitely pick up on more of the subtleties but initially you can just enjoy the fighting (of which there is plenty), the lush scenery and costumes. The sets are beautiful. It can feel surreal in moments, particularly when the characters find themselves at Solitary Villa. This location is in the book as well and pretty crucial to the plot. Here it appears somewhat suddenly and immediately challenges the readers assumptions about what is real and what is false. I don't want to spoil it, but I will say I think it is one of the more inventive set pieces in wuxia and they do a good job bringing the idea from the pages of the Eleventh Son to the screen. The fight choreography is classic. Exactly the sort of thing you expect from a late 70s film, but it has a punchiness and vibrancy that is sometimes lacking in similar movies. This is more in the rigid and posturing approach to martial arts cinema, so it is quite stylized. One thing that really sets it apart is the extensive use of the spear by Xiao, which blends so well with the other weapons. Ti Lung handles the fights, and this weapon in particular, with great elegance. The tone of the film is quite dark and it grows darker as the plot develops. In the spirit of movies like Killer Clans or The Last Hurrah for Chivalry it focuses on hypocrisy, corruption and the weaknesses of the characters. That isn't to say the hero is unheroic, or that everyone is ineffectual, just that this is a world populated by people with scars and shortcomings. But there is also something liberating about them. The characters are stark and compelling. Plenty of changes were made but they are in the spirit of the book and work well. One of the more unusual characters is Lady Feng. In the book she has a much more prominent role but I think largely out of consideration for time, in the film she makes only a handful of important appearances (though like the book the film opens with her). Her nickname is Man Junkie* and she flaunts social convention by taking many lovers. In an exchange with Xiao she admits this but points to the hypocrisy of scolding her for such behavior while allowing men to sleep with as many women as they want. In many ways Lady Feng and Xaio are two sides of the same coin. They are both incredible martial heroes who feel stifled by the rules imposed upon them by the social order. Lady Feng resists it in her way, while Xiao resists by being a lone drifter. Other worthy players include Candy Wen as Little Lord (who plays the cruel and vicious character well) and Lau Wing (as Lian Chengbi). Little Lord is a woman who often disguises herself as a man and uses her lethal Kung Fu to hound Xiao and Mrs. Lian. Jian Chengbi is a noble hero jealous of his wife's growing affecting for Xiao. Eventually the two men find themselves united against a common enemy but much of the film's first half revolves around their conflict and the ensuing duels. There are also lots of interesting martial sects involved in the chase for the sword. Of these my favorite are the Zombie Casters. They wrap their limbs in bandages and have something of a grim appearance. The music is somewhat notable and a product of its time, in a style anyone my age would recognize from countless movies and shows of our childhood (something I like to call elevator baroque). The main theme is harpsichord and winds. It is actually a bit charming the first couple of times, but they overplay it as a kind of love theme and it quickly stands out because it is so rooted to a particular era. While the climax of the film at Solitary Villa comes somewhat abruptly (definitely more abruptly than the book), and this does take a detour into the strange and surreal, I think it works and it builds upon the already dreamy atmosphere established earlier in the movie. I don't want to give away anything about the villa, but this is an aspect of the film and book I've been dying to incorporate into one of my campaigns. Swordsman and Enchantress is a movie worthy of Gu Long, filled with flawed, grimy characters and a villain who exploits peoples appetites for vices. The film is less confusing if one has read the book, but I don't think reading it is required. There are also plenty of changes from the source material (most of which make sense given the need to condense the tale into a film). It is up there with other long-inspired films by Yuen Chor. I recommend it to anyone who likes wuxia or martial arts movies. For gamers the movie is worth it for the set-up and the set-pieces (particularly Solitary Villa). One thing it helps illustrate is how unconventional wuxia characters can be (even if they are clearly contained in a conventional world). Another reason to check this film out is the book its s based on, The Eleventh Son, is available in an official English translation by Rebecca Tai (the translation is quite good). So it may be a nice lead into the material (or vice versa). *In the book her nickname is The Enchantress.